Book Review: Policy Change, Public Attitudes and Social Citizenship: Does neoliberalism matter? 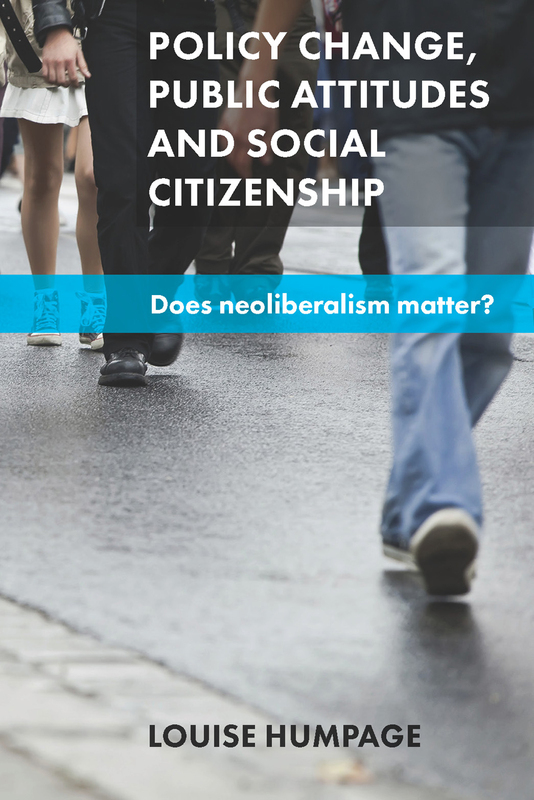 Neoliberal reforms have both revealed and effected a radical shift in government thinking about social citizenship rights around the world. But have they had a similarly significant impact on public support for these rights? This unique book traces public views on social citizenship across three decades through attitudinal data from New Zealand, the United Kingdom, and Australia. Maxine Montaigne holds the book’s comparative angle is an interesting and useful contribution, allowing for a deeper questioning of the role of political history and culture in both the implementation and public acceptance of reform. Policy Change, Public Attitudes and Social Citizenship. Louise Humpage. University of Chicago Press. February 2015. Despite its deceptively compact appearance, Policy Change, Public Attitudes and Social Citizenship by Louise Humpage, has an extensive and ambitious scope. On the one hand it provides a broad but concise overview of the various policy changes that have shaped New Zealand over the last few decades, with a particular emphasis on the suite of ‘neoliberal’ economic reforms that many western economies embarked on during this period. Throughout the book this policy historiography is set against the changing attitudes of New Zealanders to a range of economic and social questions, with opinion sometimes running with government policy, sometimes against. The analysis of changing public attitudes goes to the meatier, if somewhat vague question asked in the book’s subtitle; “Does neoliberalism matter?” By this question the book sets out to explore “To what degree and in what ways has neoliberalism shaped public attitudes towards social citizenship?”. The important and interesting hypothesis being tested here is that large-scale policy reforms, in this case the neoliberal reforms of the 1980s onwards, do more than simply change the ‘rules’ of the economic ‘game’, they change how we think about the game itself, and whether over time we come to accept these new rules as fair, despite initial opposition. To answer these questions, both the policy and attitudinal shifts of the New Zealand context are compared with the experiences of the United Kingdom and Australia — countries with similar cultural and political paradigms that have each undergone the same kind of reform programme, if at different times or to different extents. This comparative angle is an interesting and useful contribution, allowing for a deeper questioning of the role of political history and culture in both the implementation and public acceptance of reform. This also allows for some introspection on the impact of the different electoral systems; New Zealand’s mixed-member proportional system, Australia’s full-preferential instant-runoff and the UK’s first-past-the-post. With talk of electoral reform in the lead up to the UK’s general election, it is important to think about how such a change might impact the policymaking process. Humpage describes the period preceding neoliberal reform as the ‘Keynesian policy regime’. This period, broadly covering the post-war years up until 1980, is characterised as one of increased collectivism and the development of a ‘social citizenship’ ideal. However this policy framework did not survive the various economic challenges of the 1970s onwards, and a long period of economic reform and consolidation followed. This book examines four key areas in which policy reform have had the largest social and economic impact: employment and wage policy, social security reform, the trio of healthcare, education and superannuation, and the redistributive role of the tax system. Each of these areas have experienced a considerable shift in terms of both public expectations of the government’s role, as well as in the ideological rhetoric used by politicians seeking to cut back on expenditure, access or both. The chapters on social security reform and the areas of health, education and superannuation provide some useful insights into the way policy reform and public attitudes have shifted over time. Gauging public attitudes via the New Zealand Election Study (NZES), Humpage finds that support for social security dropped steadily over the past few decades, as the political rhetoric moved towards increased conditionality. Attitudes towards the unemployed in particular have hardened during the period of reform, with New Zealanders becoming less supportive of government support, and more likely to agree that people on welfare should have to work for their benefits. This is contrasted with the public’s attitude towards the provision of healthcare, education and income support in old-age. Support for the government’s continued responsibility in these areas has remained much more consistent across the period, not only in New Zealand but in Australia and the UK also. Interestingly it seems that public attitudes in these areas do indeed respond to government policy, and particular spending levels; during periods where spending decreased public support for free education and health tended to increase, while periods of increasing spending resulted in a drop in public concern. This highlights the complicated relationship between policy and public attitudes; if policy makers interpret reduced public concern as support for further reducing spending in a particular policy area, they might soon find public opinion turning against them. While the juxtaposition of policy reforms and changing public attitudes does provide some interesting insights into what, if any, relationship might exist between these, there is a sense that this approach can only go so far in answering such a ‘big’ question. The reliance on a small number of attitudinal surveys, which by their nature only offer snapshots of public opinion at three year intervals and only ask a small number of questions relevant to this study, limits the scope and depth of any interpretation. The author must make do with these however, as so few sources provide consistent information about public opinion over such a long period. The comparison with the experience of Australia and the UK was perhaps intended to mitigate this issue of depth somewhat, but brings its own problem of comparing surveys with different methodologies and questions, and which don’t always cover the same time period. The ambitious scope of this book is thus in some ways both its strength and its weakness; the ‘big’ question of how policy reform impacts public attitudes demands the kind of cross-country, longitudinal comparisons that form the core of this book’s analysis. That there is limited data available across the time period for all three countries is certainly not an argument against making a valiant attempt such as this. However the weakness of this analysis comes from its difficulty in making any conclusive, let alone predictive, statements about what all this data is telling us. In terms of understanding the relationship between policy and public attitudes, the tantalising problem of causality has not quite been teased out fully yet. However as a broad and comprehensive overview this book makes a valuable contribution, and lays the groundwork for further work in this fascinating area. Note: this post originally appeared on the LSE Review of Books. It gives the views of the authors, and not the position of Democratic Audit UK, nor of the London School of Economics. Please read our comments policy before posting. Maxine Montaigne received a Master of Economics from the Australian National University and is now working towards a PhD in the History of Economic Thought at the London School of Economics. Her research explores the way economic ideas were deployed within the various population controversies of the 19th century, including the debates on poor relief, contraception and eugenics. More broadly she is interested in the way politics, economics and social issues intersect in the public sphere, most obviously in the media but also in political discourse as well as literature.